Armed with just a tape recorder and a tiny studio, a woman with a passion for sharing spiritual wisdom decided to follow her dream. In 1985, Tami Simon founded what we know now as a very successful multimedia publishing company – Sounds True. Growing from a one-woman company to a business that employs more than 80 people, Sounds True disseminates teachings centered mainly in spiritual wisdom, but also in health and wellbeing. The ethos behind the mission is that when we “wake up”, we realize the interconnectivity we share with one another. This prompts us to follow a sense of purpose and take greater responsibility for ourselves and the world at large. Partnered with some of the leading teachers in various fields, Sounds True publishes audio, online programs and books that support spiritual awakening, transformation, health and healing, and psychology. Sounds True also hold events/retreats that bring people together, helping them connect with one another and accelerate their journey. What prompted me to write this review and share this resource with my readers was actually somewhat of a surprise. I ordered a book from Amazon by Dr. Joel Khan called The Plant-Based solution. When I opened the book there was a card in there advertising some Sounds True audios. I thought, this is strange, what links does this have to the book, and how would they know I would be interested in Sounds True. Moreover, did they know that I have been purchasing products from the Sounds True store for a number of years? For a moment, it all got a bit conspiratorial. Of course, this wasn’t the case. When I looked at the spine of the book I saw the Sounds True logo. I then realised, to my surprise, that they had published the book. Despite having purchased things from the store in the past, I had never really looked into the back story, or any of the other projects that they were involved in. So I decided to dig a little deeper, and I was mightily impressed. It really is a great store, and one where I think the majority of my readers would find something of benefit. As a publishing company, Sounds True offers a library of more than 1500 publication, disseminated through various media, including audio recordings, video programs, music recordings, books, online courses and in-person events. Sounds True has released, and is continuously releasing, recordings of original works by various lecturers, teachers, and writers. A distinguished speaker in various fields such as spirituality, health, and consciousness and bestselling author, Caroline Myss is also a producer of compelling audio/visual products that cover healing, personal development, and spiritual awakening. Caroline’s recent book, Defy Gravity, explores how healing is achieved beyond the bounds of reason. Author of the bestsellers A New Earth: Awakening to Your Life’s Purpose, and The Power of Now – sold around 5 million and 3 million copies respectively in North America alone – Eckhart Tolle was named one of the most spiritually influential people in 2011. A bestselling author and Vipassana teacher, Jack Kornfield has set himself as one of the most trusted meditation gurus and spiritual masters of today. He has published several bestsellers and is best known for his After the Ecstasy, the Laundry: How the Heart Grows Wise on the Spiritual Path. Aside from being a professor, Jon Kabat-Zinn is also a founding member of Cambridge Zen Center and is the creator of mindfulness-based stress reduction (MBSR) approach. He is also the founder of the Stress Reduction Clinic and the Center for Mindfulness in Medicine, Health Care, and Society at the University of Massachusetts. An author, psychologist, and teacher, Tara Brach shares teachings based on Western psychology and Eastern spirituality. She is the author of books, Radical Acceptance and True Refuge: Finding Peace & Freedom in Your Own Awakened Heart. Together with Jack Kornfield, she co-founded the Awareness Training Institute (ATI), offering mindfulness and compassion courses. With so many products to choose from, it can be hard to decide which one is best suited to you, or indeed which one of the many that you want to buy. The website has the option of filtering by most popular, so I’ll run through some of these to give you an idea of what’s on offer, starting with online courses. By the way, Sounds True offer a FREE video series with Jack Kornfield and Tara Brach. It’s called The Power of Awareness and designed to transform your life through mindfulness, compassion & wellbeing. Prior to the Internet, and even in its infancy when speeds were slow, taking a course meant enrolling at a physical location and turning up each week on time. For those with demanding jobs, busy social lives, kids and all the rest of it, this was a big ask; despite how interested you were in learning something new. But now we all have access to courses which we can fit around our schedule: We can choose when we learn, and even where we learn thanks to mobile devices. Sounds True offers online courses in spiritual awakening, health, healing, personal growth, and successful relationships. Developed by Peter Levine, this course taps on your innate ability to heal yourself. The course is designed for anyone who has experienced any trauma in their life and feels unable to move forward and heal the wounds. When we think about trauma we tend to think of a head injury from a car accident or something like that, and while this is certainly a very serious circumstance, trauma can come in many guises. For example: being very hurt from a relationship, or being unable to get over a bad experience that has caused you to develop anxiety. The Healing Trauma course teaches you how trauma affects the body, and how you can transform your mental and physical state to begin the healing process. This is a course I have personally taken, which I review here. I have taken a couple of these courses online in the past and this is without doubt the most outstanding of the bunch, simply because of its high quality video content and the level of expertise of the instructors. The course is conducted over an 8-week period, covering how mindfulness can be implemented in your life, and how it can help many different aspects of your life. This course is an excellent way to propel yourself toward greater control over your stress levels and emotional responses, and how to practice self kindness and compassion – which in turn will manifest itself in greater compassion and empathy for others. In a nutshell, it’s a very positive course that will quickly start to give you a more positive life balance. Sounds True offers spoken word recordings in CD, DVD, audio download and video download formats. Aside from spiritual wisdom and awakening, other categories supplied include health and healing, meditation, and relationships. Morning Energy Meditation by Caroline Myss: This energy-boosting meditation focusses on bringing awareness to your bodily energy system to help you face the day with faith, hope, positivity and love. Radical Self-acceptance by Tara Brach: Tara instructs you on the importance of self-acceptance and how freeing yourself from self-wrecking insecurities can positively change the way you live and propel you to greater heights. The Ashtanga Yoga Collection by Richard Freeman: This video guides you through the practice of Ashtanga Yoga, focusing on the union of posture, breath and body movements. Presence Through Movement Qi Flow Yoga by Kim Eng: You’ll learn that your body is more than just a physical figure; it is an important instrument to access and cultivate the vital energy within us. Awakening in the Now by Jack Kornfield: An awakening to the liberating fact that the present is what matters the most, and where your greatest treasure can be found. 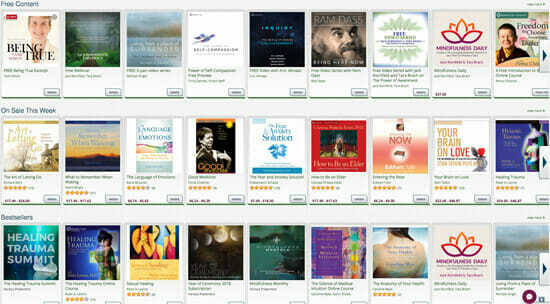 There’s music available too, primarily focused on the spiritual, healing and meditative fields, featuring the works of artists such as Jeffrey Thompson, Sandra Ingerman, Deva Premal, Aleya Dao, Jai Uttal, Nawang Khechog, and Savina Yannatou. You will also find a number of books on the site, but I usually buy my books on Amazon. I think we would all agree that once companies begin making a solid profit they should further increase their corporate social responsibility and impact on broader society. And that’s one thing I really like about Sounds True: Despite the growth and development of the company in past years, it has retained the personal touch of an independent company that rose out of humble beginnings, and its intention to impact the world positively. Sounds True makes efforts to go green and minimize the ecological footprint of the business. Such efforts and initiatives include joining the Green Press Initiative, printing books using chlorine-free paper, being a member of the Lifestyles of Health and Sustainability community, and purchasing and using renewable energy in their offices and warehouses. Sounds True works hand-in-hand with the Prison Dharma Network and Prison Library Project in bringing light and hope to federal and state prisons and jails all over the country. The company sends used books and audio and music programs to inmates to help with personal development and transformation. I think this is a really positive project. Obviously there are those who go to prison for heinous crimes that none of us could forgive, and indeed we would not want those people to be released back into society. But there are hundreds of thousands of people in prison for minor offences, things we would all agree as mistakes on their life journey. Providing a support network that encourages prisoners to read and expand their minds and develop their purpose in life can only be a positive thing. Customers and users of the programs are also encouraged to support the initiative by sending their used Sounds True CD/DVDs and books. As a small compensation, anyone who donates will receive a gift certificate worth $10 that can be applied to their future purchase in the site. In recent years we have all been exposed to news regarding the way big corporations treat their staff. We’ve all heard the horror stories of Walmart in the US, and zero contract hours in the UK. Many of us know people who work very hard in low-paid jobs and feel aggrieved that the company they work for doesn’t care more about their well-being. So when buying from a company, it is always reassuring to know that the staff working there are being treated well. In light of this, I was pleased to read that Sounds True is very much interested in the holistic growth and development of staff. One of their initiatives is Sounds True Dogs, which encourages employees to bring their canine and feline friends to the office. The office often accommodates up to 15 dogs and cats on any given day. That might be a little too much “woof” for me, but I appreciate the sentiment. Okay, so let’s get into some of the more boring details regarding customer service, shipping and the return policy. It is all pretty much standard fare and what you would expect from any online store today. Though they do have the additional nice touch of a live chat. Of course this is available only during office hours (Monday-Friday, 8 am to 5 pm – MT), but I do occasionally use this service on different websites when I get stuck with a question about a particular product – so it’s useful. They also have a phone number (303-665-3151), which I’m sure many people will be pleased to hear. Many online stores do not have a phone number, not necessarily because they don’t want one, but because it costs money to employ someone to man the phone and deal with enquiries – email is more cost efficient for smaller businesses. However, a phone number sure is helpful when you have a query that you want to get dealt with very quickly. Sounds True ships their products both locally and internationally. Standard: The US Postal Service delivers orders to all physical addresses, PO boxes, and military destinations in all US territories including Alaska, Guam, Hawaii, and Puerto Rico within 6-12 business days. Physical orders worth $50 and up are free delivery. Expedite: With a shipping cost of $18.95, FedEx delivers orders to physical addresses only in all US territories including Alaska and Hawaii within 3-4 business days. Express: FedEx delivers to physical addresses only in all US territories, including Alaska and Hawaii, within 3-4 business days, for a shipping cost of $25.95. I have to say that Sounds True’s return policy is amazing. They offer a 1-year refund window! I don’t think I’ve come across another online store that offers such a generous refund policy. The policy covers the return of and refund for hard goods, digital downloads, subscription and live events. The return is within 1 year from the purchase date. The return is accompanied with the receipt and a filled out refund or returns form. Original shipping charges are not included in the refund. If your request is made over 120 days after the purchase date, you’ll receive a check as funds. For products not made by Sounds True but are offered on their website, the warranty period is indicated in the product description. For refunds on digital downloads, subscriptions and live events, requests should be sent to [email protected] along with complete name, order number, postal code, contact number and the reason for the refund. Aside from the products on offer, You might be interested in some of the free offerings to be found on the website. This feature presents weekly podcasts by different experts from various fields. The podcasts range from minutes to hours, sharing captivating and compelling messages on all things life. Insights at the Edge: Podcasts presenting interviews with spiritual thought leaders. Producer’s Pick: Podcasts personally selected by expert producers to convey clarity. A Good Minute: Podcasts that share wisdom to turn what the mind speaks into heart priorities. Wise Words: Podcasts that impart wisdom through contemplative reading. Aside from the Weekly Wisdom, Sounds True Radio is another cool feature available on the website. It offers 24/7 listening to music by different artists, and interviews with leading authors. The radio allows you to listen in full to newly released songs, and offers an opportunity to buy the whole album – should you find yourself enjoying the peace the music brings. Everyone loves a free gift, and Sounds True offer two. In exchange for your email address ,you can download The Practice of Mindfulness (features 6 different guided meditations by different experts. ), and Meditation Music – which is more easy listening than seated meditation; in my opinion. Of course, by providing your email address you are giving them permission to send you emails about latest releases, discounts and the Weekly Wisdom. Well that just about wraps up my review. It was pretty long, I know, but hopefully you got a good idea of what Sounds True is all about, what’s on offer, and what to expect when making a purchase. Enjoy!